As usual, I wanted to try everything, so I went with a wine flight. That way I would get three different German wines to taste. 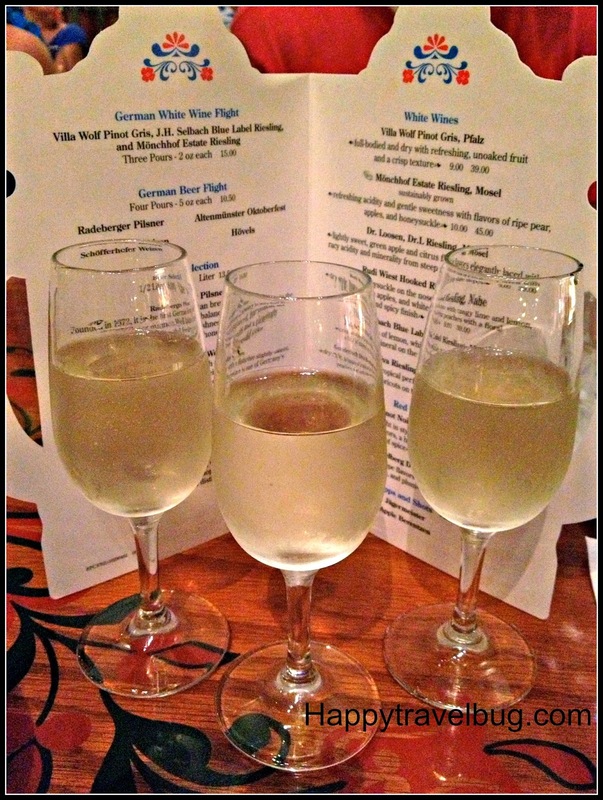 It included a Pinot Gris and two Rieslings. I enjoyed them all! The atmosphere at the Biergarten Restaurant is definitely part of the charm. I took some video of the entertainment as well as the buffet for you. That’s right, it is an all you can eat buffet! My in-laws could not believe how many times I went back for more. Like I said, I LOVE German food! I started with the salads. German salads are interesting in the fact that some of them are all meat, like the wurst salad. It isn’t “the worst” salad (sorry, couldn’t resist) in fact, it is pretty tasty. I also had a pretzel roll (yum), beet salad, cabbage salad, macaroni salad and a cucumber/onion salad. My mom actually made a lot of these when I was growing up. We come from German heritage, which could be where I get my love of German food. I guess it could be comforting to me as well, since I grew up with it. The next plate was my meat and potato plate. It had several German sausages, Beef Rouladen (the rolled up one), chicken schnitzel, roasted pork, potatoes and some sauerkraut. My favorite is the schnitzel. I am a big schnitzel fan! And that gravy was the perfect topping. I also really liked the beef. As far as the sausages go, I enjoy them, but I wouldn’t go back for seconds. My husband, on the other hand, would eat a plate full of those. Funny how everyone has different tastes. I must confess, I went back for a second entree plate. This one consisted mostly of vegetables, so don’t be so alarmed. Of course, I had to have some spatzle (with a little gravy on top for added goodness), along with green beans, red cabbage, hot potato salad, asparagus & mushrooms and something else that I have no recollection of eating. Interesting! Anyway, loved it all. You know I was swollen up like a giant oompa loompa after eating all this salty food. But I didn’t care! Of course we had to end with a little something sweet. I was pretty full (shocking), so I just ended my meal with some apple strudel and vanilla cream sauce. I prefer German food over the desserts or this plate would have looked a lot different. Chocolate anyone? 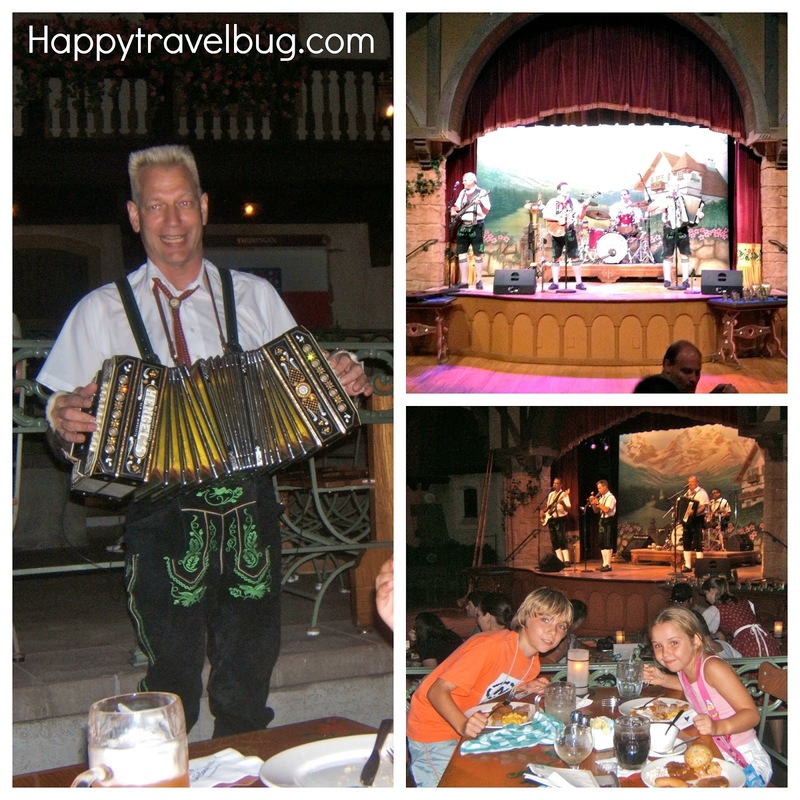 As I said in the video, I have never been to Disney World without eating at the Biergarten Restaurant. It has become a family tradition that we all look forward to. I have pictures of my kids at all ages eating here. I love that! Do you have a family tradition restaurant? You've got a lot of food here! I can see why you felt like a giant oompa loompa. I don't blame you, I'd pig out too, it's good food and wine! I'd have been back for three or more plates, I am certain. Love the Oktoberfest celebrations. Fun post. Its nice to hear that you like German food 😉 for most, I think it might be an acquired taste! I post German recipes from time to time, so check us out when you have a minute! Love it there, really awesome food and drink!! How fun! I've never eaten here (only in the quick-service place next to it), but I do love German food. The Germany Pavilion looks like a fairy tale. It's so pretty! It is probably my favorite part of World Showcase. Thanks for sharing these details about Biergarten! I love the way it looks as well. I just love the world showcase in general! We've actually never tried Biergarten but your photos really make me want to rectify that situation this year! Yum! I hope you enjoy it! Keep me posted. We love the Biergarten! It's a must do for our family. We've shared many unforgettable meals there.